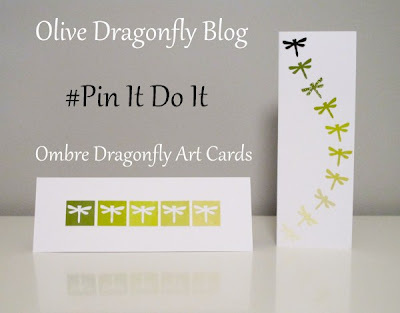 Sometimes you see a pin and you just can't help but do it (and blog it) straight away! I had a quick look at my Pinterest feed on Sunday morning and saw an alert from Sarah about a pin she thought I'd like. She was right! It took me a long time to find the original source to credit the idea - the pin I saw first went to a random jpeg so I did a reverse google image search which lead me to a facebook page, to another facebook page, to a blog, to someone's instagram to their blog which seems to have the original idea! I absolutely LOVED the idea so went to Homebase to get a few Dulux paint swatches. 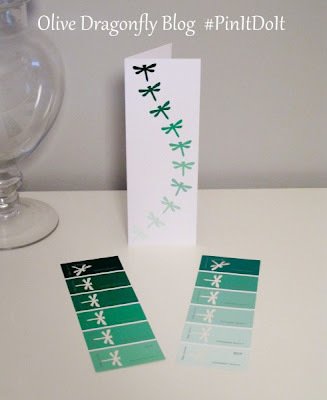 (They'll also come in useful when I can convince the husband we should redecorate our bedroom since I got all my favourite colours of course!) 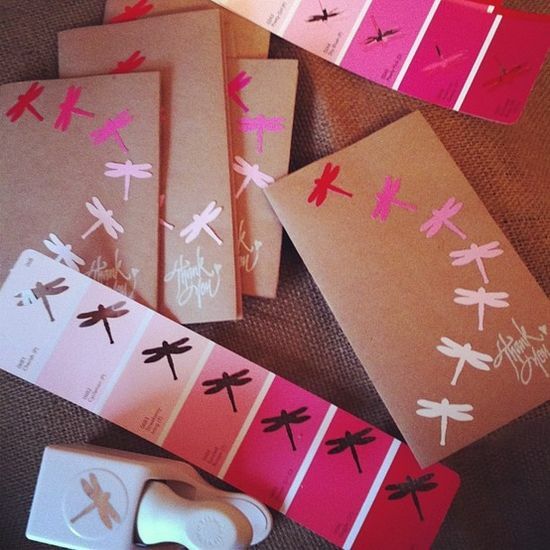 I already had a dragonfly punch we used for the wedding favours/place names (of course!) and had some cards left over from when I used to sell my photos at craft fairs and made photo cards. I also had a flash of inspiration when I made the olive green one and remembered I had some of the glitter paper left so added that in for a bit of a twist. 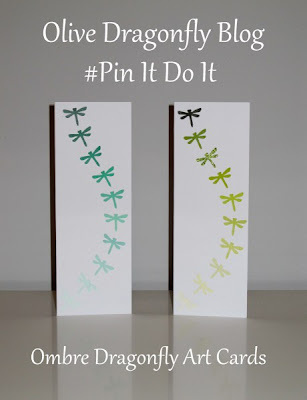 It's so easy, just punch out your shape from each of the colours (I used a combination of two strips to get more of a range) taking care not to punch where the words are and glue them onto card in the pattern you want. I had pre-folded cards from ebay which came with envelopes as well. I think I bought the punch on ebay too but you can also get them from lots of on-line craft shops. 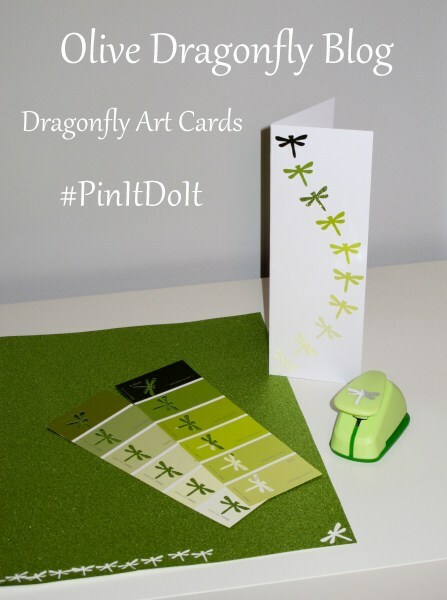 I've punched out some smaller dragonflies to place one in the corner of each envelope as well. You can find more #pinitdoit challanges by clicking on this badge. We're starting up a new linky for others to join in posting theirs too! P.S. We now have a facebook page! I'll be keeping it up to date with photos from Craft Club and Pin It Do It projects. If you try out any of the projects you see here, send them in and we'll share them on the facebook page. These have worked out beautiful. I saw this on pinterest and repinned it to my 'inspiring ideas' board. I like how you can also use the paint colour cards as bookmarks once done! This is such a you thing to do and it seems like it has worked out so well! Gorgeous! I look forward to seeing the big heart art-piece. Thank you so much for tracking down my original photo on this idea I had! 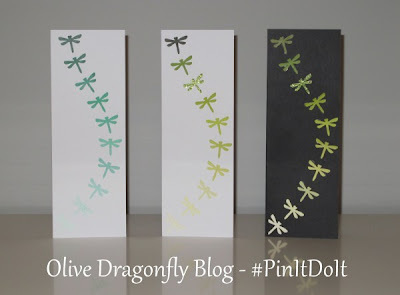 I can see why you liked it so much-dragonflies! Hope you're having a good trip right now! 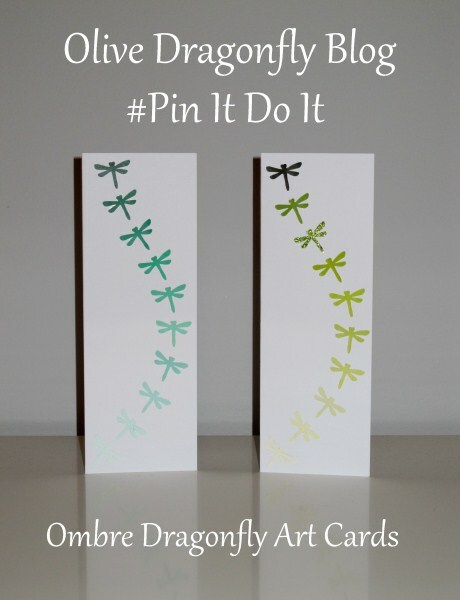 They look fab, I love things using punches and the ombre works so well. A while ago I did something similar to make this nursery art for my sister which she loved; I've already got everything cut out to do the ones for Holden's new room using elephants and ladybirds but havent got round to it yet!